If you’re like most people, you don’t spend much time thinking about what would happen if anthrax was released into your local subway system. Luckily, Sandia National Laboratories engineer Mark Tucker has spent much of the past twenty years thinking about incidents involving chemical or biological warfare agents, and the best ways to clean them up. 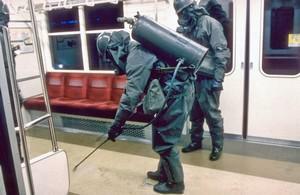 Tucker’s current project focuses on cleaning up a subway system after the release of a biological warfare agent such as anthrax. Sandia Lab says that in addition to developing Sandia’s decontamination foam, which was used to decontaminate parts of federal office buildings and mailrooms during anthrax letter attacks in 2001, Tucker has led Sandia’s team during numerous chemical and biological remediation projects sponsored by the Department of Homeland Security Science and Technology Directorate’s Homeland Security Advanced Research Projects Agency. These projects focused on specific remediation situations, starting with cleaning up an airport after a biological agent release. Teams of researchers tested available decontamination methods and technologies, learned what current technologies can’t do, researched solutions and then developed recommendations in case of an airport attack.